This vanity is a great way to add traditional style to your bathroom. Its comes with a nice white marble counter and brown solid wood base for strength and style. Put a nice touch on your bathroom's look with this vanity set from Wyndham Collection. Enjoy the popular traditional look in your bathroom with this beautiful vanity. The good-looking white marble counter and brown solid wood base make a big difference in your bathroom. This set from Wyndham Collection is great for anyone looking for great style and function in their bathroom. Designed with a traditional style and strong build, this vanity is a perfect choice for any bathroom. The white marble counter and brown solid wood base make this piece great for any bathroom. Make your bathroom look like new with this good-looking, useful set from Wyndham Collection. Bring a fresh, traditional look into your bathroom with this vanity. Its comes with a nice white marble counter and brown solid wood base for strength and style. Put a nice twist on your bathroom project with this classic piece from Wyndham Collection. This vanity has both an all-around look and a traditional style. Its white marble counter and brown solid wood base are very easy on the eyes. Redo the style of your bathroom with this classic from Wyndham Collection. 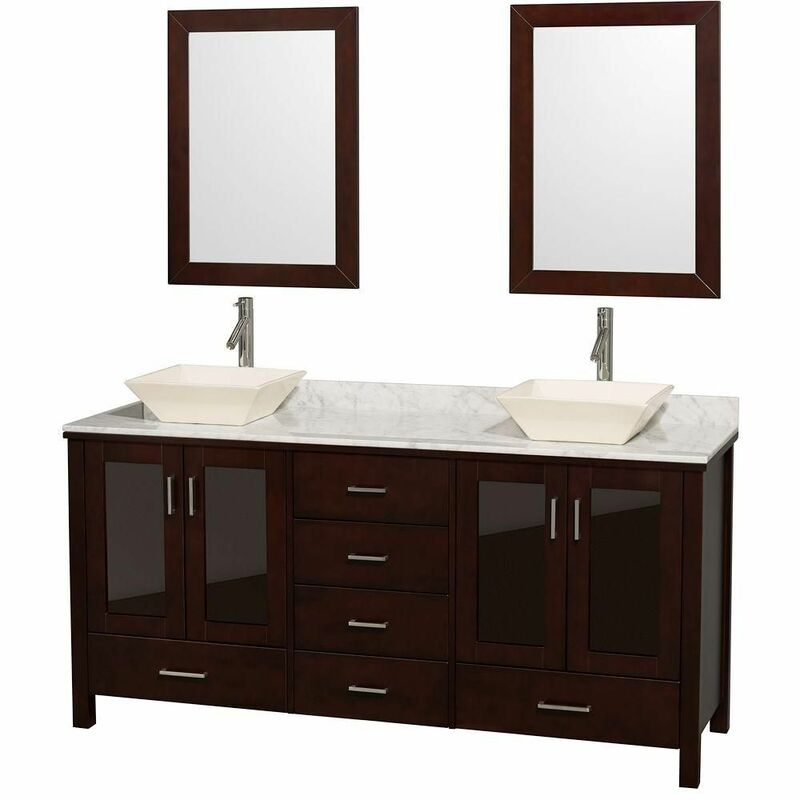 Lucy 72-inch W 6-Drawer 4-Door Vanity in Brown With Marble Top in White, Double Basins With Mirror This vanity is a great way to add traditional style to your bathroom. Its comes with a nice white marble counter and brown solid wood base for strength and style. Put a nice touch on your bathroom's look with this vanity set from Wyndham Collection. Lucy 72-inch W 6-Drawer 4-Door Vanity in Brown With Marble Top in White, Double Basins With Mirror is rated 4.0 out of 5 by 1. Rated 4 out of 5 by Ken from The marble top holes needed to be adjusted to accommodate... The marble top holes needed to be adjusted to accommodate the type of faucets we purchased which were standard size.